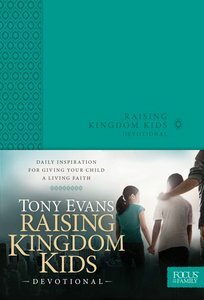 :The Raising Kingdom Kids Devotional is based on the biblical principles and concepts presented in the book Raising Kingdom Kids by Dr. Tony Evans. It offers 90 daily devotions for moms and dads who wants to raise their child with a Kingdom perspective, preparing them to take on the assignments God has for their lives. It also encourages parents as they embrace their God-given role in raising sons and daughters to become Kingdom men and women. This devotional provides overarching parenting principles from Scripture, along with teaching and inspiration for contributing to a child's relationship with God and alignment under His plan. It also provides specific encouragement to parents as they live out Kingdom-minded values and instill them in their children?including the power of prayer, wisdom, loving God's Word, getting through trials, controlling the tongue, developing patience, the surrender of service, and more. About "Raising Kingdom Kids Devotional"